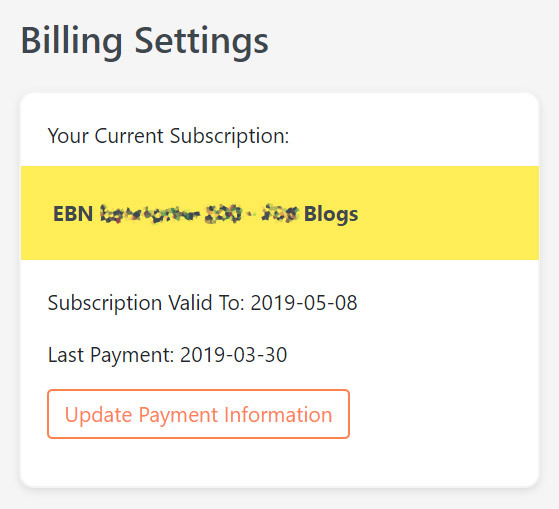 Easy Blog Networks does not store any payment information so we cannot update your billing details for you. Our payment processor stores this information so any changes made can only be done inside their dashboard. You can find the Update Billing link in the Settings page. If you have issues with paying on ClickBank, please email us and we’ll send you our backup payment provider link. Can't find the update billing link? While we have moved to a modern payment processor, Paddle, some users are still on ClickBank and this is why the Update Billing link is missing from your Settings page. Enter order number in the Order Lookup box. Enter one of the verification indicators listed on the Order Lookup box. On the Order Detail page, click the “Edit” button next to your current payment method. You will be directed to the “Update Your Subscription Payment Information” page. Enter your new credit card information where your subscription will be billed to. That’s it. You will be automatically rebilled using the new credit card information you submitted. Note: if you change your billing email, you need to notify us so we can also change the billing email inside your account.